Designing the ultimate Gravel Bike? What we learnt at Grinduro Scotland. — Quirk Cycles | Custom Steel Bicycles Handmade in London by Frame Builder Rob Quirk. Designing the ultimate Gravel Bike? What we learnt at Grinduro Scotland. Can you combine the best elements of a road-focussed machine with the ‘go anywhere’ ability of an MTB? 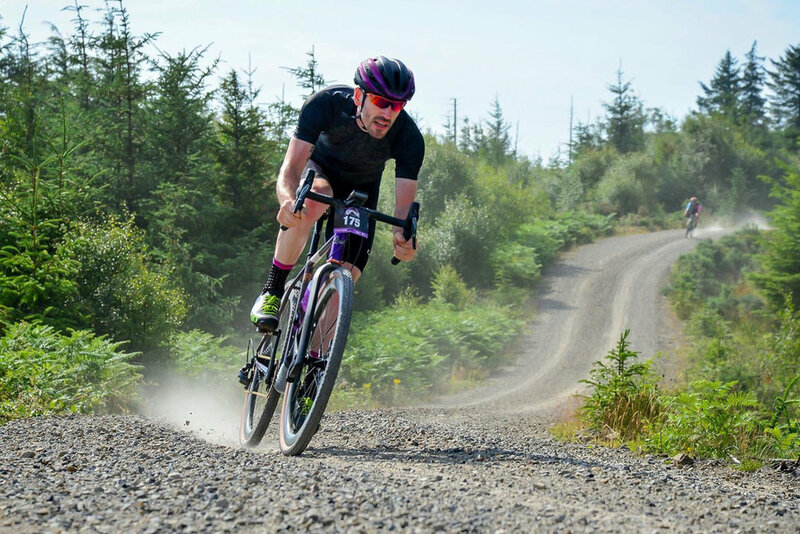 This was the challenge faced by Rob when he was selected as one of four framebuilders who faced-off at Grinduro Scotland 2018. Since I’d raced the TCR in 2016 I’d been thinking about the limits of what a road bike could do. The bike I’d designed for that race, which formed the basis for the Durmitor, had proved to be ideal for the conditions I encountered in that event, but I was keen to explore more challenging off-road conditions. Having already prototyped a few gravel designs, when Grinduro Scotland asked me to partake in their Framebuilder Build-Off (competing framebuilders design, make and race their perfect Grinduro bike with a public vote for the best build) this gave me the perfect opportunity to put what I learnt into what I saw as the final model. The timing couldn’t have been better as later in the year I was to travel to Kyrgyzstan to race in the Silk Road Mountain Race. Grinduro would allow me to test out the my design while still being in relative civilisation – Kyrgyzstan being most definitely not the place to take untested prototypes. 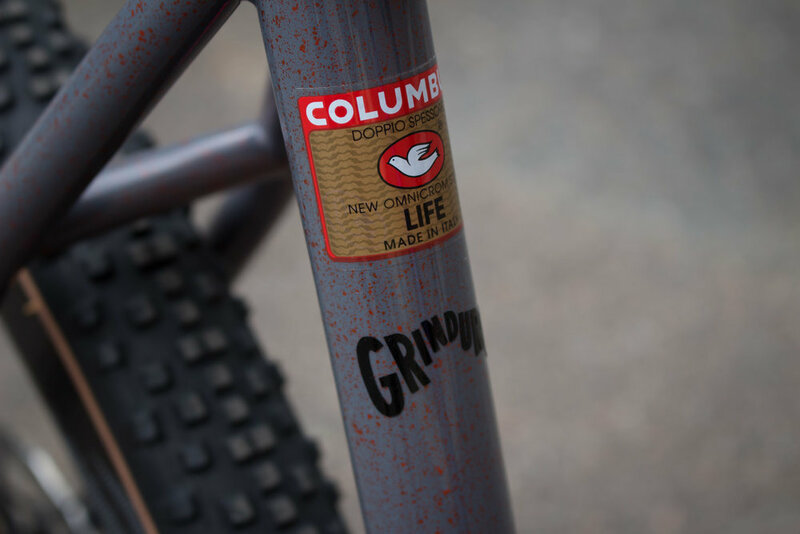 Grinduro was born in the US, in the heartland of MTB and gravel riding. The Scottish event was the second time it had skipped over the Atlantic, recognition of the growing interest in the gravel scene over here. With a mix of social riding in spectacular scenery and four timed sections as you find in Enduro MTB races, I took along a bike that has become the Kegety. I’d started out with the knowledge that the bike needed to be stable, no matter the conditions beneath the wheels. The frame’s lengthened chainstays and slack head angle acted to increase the wheelbase and improve stability when the surface got rough. The end result was a machine that would stick to the road more – you can’t control things all that well if your wheels are in the air. Working with steel allowed me to design the frame to the very specific demands I anticipated. I introduced some flex into the frame by using tubes with reduced diameters. I knew that this would improve comfort, by providing an element of suspension. It was capable of taking either 700c tyres, right up to 42mm wide, or 650b up to 47mm – I went for the 650b option that meant I’d be floating on a massive cushion of air, further improving rider comfort and reducing fatigue. The aim was to create something that combined the best elements of a road bike with those of a mountain bike. It had to be as capable climbing up a hill as it was coming down the other side. To that end, the bike features a slightly shortened rear end, just enough for tapping out a steady pace on the way up, but not so short that the stability was affected. The bottom bracket is also raised to ensure clearance from the anticipated rocks of Arran – and later Kyrgyzstan. The SRAM 1x groupset was ideal – lightweight and effective with superb braking performance from the hydraulic discs. The final piece of the jigsaw was to use a Lauf fork. Offering a good weight saving over full-sis forks with a progressive 30mm of travel meant the bike was good for all but the most extreme downhill riding. Point this thing downhill and it would fly. Grinduro was a blast and I was lucky enough to be joined by two proud Quirk owners Owen and Fiona and their Quirk gravel bikes. We played to the true sense of Grinduro and made fun the number one priority. The trails on Arran are awesome and my bike just excelled in every way. Rapid on the climbs and when it came to the downhills I was as fast as those guys on mountain bikes. On the flatter sections it was buttery smooth, capable of ticking off miles with no problems. I was delighted – this thing was itching to get off the beaten track more than anything I’d ever ridden before. Just as good as the riding at Grinduro was the time off the trails. There’s a real community building in the gravel scene, chatting over a Irn-Bru and chomping one of many fine Tunnocks teacakes, the atmosphere was brilliant. I can’t see anything but growth for gravel riding; it just seems to remind people of what it was about riding a bike that they fell for in the first place – the chance to ask “where does this path go?” and find out. I was full of confidence when I got back to London that this bike was the one for the SRMR. It excelled there too – the bike that was to become the Kegety was showing itself to be a speed-focussed machine for any gravel and off-road adventure.